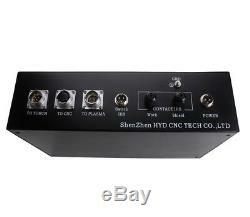 THC 24V Arc Voltage Plasma Torch Height Controller fr Plasma CNC Cutting Machine. XPTHC-100V is a brand new design THC controller, can fully replace the old version of XPTHC-100III. Based on the old version's function, this new version is with many new function/changes as below. This arc voltage plasma torch height controller supports almost all plasma cutters on the market like Thermal Dynamics, HD plasmas HPR130, 260, Ultra-cut series, etc. Also, it supports all CNC cutting controllers on market, like Burny, industrial level controllers or Mach3, because it can start Auto Height control with or without Auto enable signal from CNC(but with Auto enable/disable signal from CNC, THC would work better). Basic parameter: -Input Power: AC24V±5%, 50Hz/60Hz -Down/Up Motor: DC24V DC MOTOR -Motor Drive: PWM -Output Current: 1A-4A, Load capacity: 100W. Working temperature: -10 to 600C -Voltage Divide ratio: 100:1 -Control accuracy: ±1V to ±3V -Size: 320mm260mm90mm -The speed of lifting: 1000mm/min to 4000mm/min. Auto Initial Height Sensing(IHS). Torch Retaining Cap IHS and Proximity Switch IHS (NPN and PNP), Proximity Switch IHS is backup for Torch Retaining Cap IHS for cutting dirty/rusty workpiece, anti-collision torch clamp needed(optional). Torch Anti-Collision Function(requires to work with anti-collision torch clamp). No matter it is on Auto Control Model or Manual Control Model, when torch head touches the workpiece, THC would automatically lift torch up to IHS height. Freeze Auto Height Control on Corner Signal. The controller can recognize Corner Signal from CNC and freeze Auto Control Model on receiving this signal, and we have a unique design to backup this function. Lifting torch Up on IHS Disabled status. On IHS Disabled status, jogging torch head down until it reaches workpiece, when Arc Starts, torch head would lift up automatically to the Set Height set via the button SET-IHS. Lifting Torch Up on TURN ON or Arc Off. When CNC is TURN ON or Plasma Arc Off, THC would lift torch up for 2 seconds, please notice this Function during commissioning, avoiding the possible damage of limit switch or lift device. 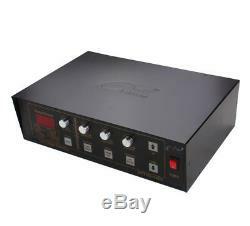 Set Button Set-PIERE (set Pierce delay time), to delay output this signal, it is a switch signal, set to detect arc voltage lead in THC. Once THC detect arc lead in, it send arc ok signal to CNC to start cut. Many functions can be manually operated on the operation panel, such as, set Auto/Manual mode of THC, manually control torch Up and Down, IHS test, Arc Start test. Isolation Voltage Divide, the Voltage Divide ratio is 100:1/50:1. Once Isolation Voltage Divide function damaged, user can also use Non-isolation Voltage Divide on our voltage divider. 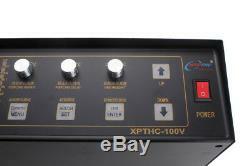 XPTHC-100V is with much more simple setting method. P0-P9 data can be set directly on the control panel, at the meantime, old version's quick-setting knob is remained. XPTHC-100V's motor wiring method is the same as the old version, but adding limit logic modify setting parameter P6 and current limit state display. Limit logic's default parameter is PNP effective(P6:1), same as the old version. XPTHC-100V's proximity switch's wiring method is the same as the old version, but no need to set the proximity switch's mode on the initial jumper, just need to modify the P9 value on the control panel. 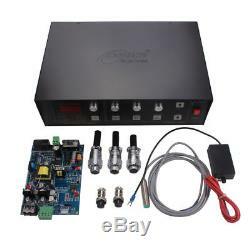 XPTHC-100V's "TO CNC" port: Pin1, 2, 3, 4, 5, 8 is the same as the old version's, but Pin6 is for Arc feedback output, can be connected to CNC's Arc feedback input directly; Pin7 is "Collision" output, can be connected to CNC's collision input directly. There is built-in Dynamic Piecing function in the controller, so we removed the old version's outer dynamic piecing function (Pin9Πn10). XPTHC-100V's Torch Retaining Cap IHS' wiring is basically the same as the old version, but we added a "High Voltage Isolator" for high frequency Striking Arc Plasma's Torch Retaining Cap IHS; we also added torch tip's IHS function on XPTHC-100V: the red IHS wire on the "High Voltage Isolator" can be directly connected to the plasma torch's strike arc wire(no need to tie it on the torch tip). Under the Torch Retaining Cap IHS & Torch tip IHS mode, the controller has under-water IHS function: need to modify P0's value to be "1", the "High Voltage Isolator" should be installed beside the plasma torch. 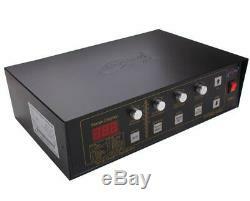 XPTHC-100V's power supply is the same as the old version, can be powered by DC24V or AC24v. XPTHC-100V's voltage divider's installing size is the same as the old one, but voltage dividing ratio changed to be 50:1(to make its controlling more precisely), meanwhile. Voltage divider's power supply changed to be AC/DC 24V(the old version's is AC220v), can share the same power supply as the controller's, please pay much attention on this change! When connect the voltage divider to the controller, the 4-pin connector's("TO PLASMA") wiring can be the same as the old version's, but our new wiring method for it would make it with much better anti-jamming performance. Anti-collision function torch clamp(Not included). Anti-collision function torch lifter(Not included). Remote is defined as islands and highlands; or a post code/zip code that is difficult to serve; or a suburb/town that is distant, inaccessible or infrequently served. We are looking forward to a further extension of pleasant business relation. 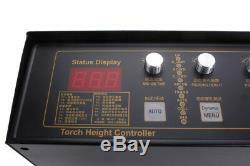 1X Arc Voltage Torch Height Controller Unit. ECheque will be held until cleared. 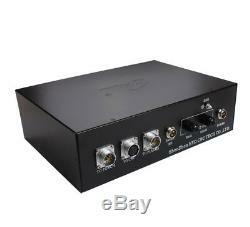 This item is ALL BRAND NEW and in the original factory box and packing, All products have been checked and packaged in good condition before dispatch. We will give you a return ID. Meanwhile Please tell us what the defect is, to eliminate improper use. The item "THC 24V Arc Voltage Plasma Torch Height Controller fr Plasma CNC Cutting Machine" is in sale since Tuesday, October 18, 2016. This item is in the category "Business & Industrial\CNC, Metalworking & Manufacturing\Welding & Soldering Equipment\Welding\Welders, Cutters & Torches\Plasma Cutter Torches & Bodies". The seller is "gold-bucket" and is located in Shenzhen. This item can be shipped worldwide.